A potion is a magic liquid that produces its effect when imbibed. 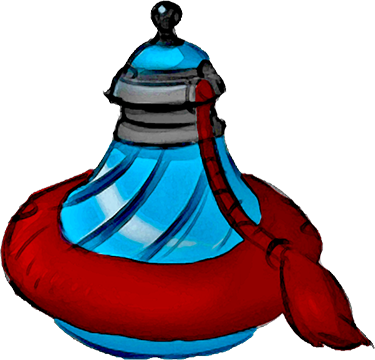 Potions vary incredibly in appearance. Magic oils are similar to potions, except that oils are applied externally rather than imbibed. A potion or oil can be used only once. It can duplicate the effect of a spell of up to 3rd level that has a casting time of less than 1 minute and targets one or more creatures or objects. When creating or attempting to purchase a specific potion or oil, it is important to keep in mind the information below. In order to be made into a potion or oil, a spell must meet all of the following criteria. It must be a spell of 3rd level or lower. It must have a casting time of less than 1 minute. It must target one or more creatures or objects. It must not have a range of personal. The tables below present spells that are commonly made into potions or oils as well as their base costs. While most of the spells in these tables are commonly made into potions, spell names with asterisks (*) after them are typically made into oils instead of potions. *Some prices have been updated from the 3.5 chart to fit Piazo’s formulas from the CRB. **Protection from arrows works differently in Pathfinder than it did in 3.5, chart adjusted to fit pathfinder rules. The list below includes potions from many various Paizo sources. Potions & Oils d20pfsrd.com has added from various 3rd Party Publisher sources can be found at the link below.